FOUR STARRED REVIEWS! 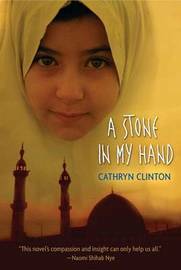 Now available in trade-paperback is the haunting story of a sensitive, observant girl who finds her voice in 1988 Gaza City. (Age 11 and up) The year is 1988 in Gaza City, and it has been a month since eleven-year-old Malaak's father left to seek work in Israel, only to disappear. Every day Malaak climbs to the roof and waits, speaking little to anyone, preferring the company of the little bird she has tamed. But her twelve-year-old brother, Hamid, has a different way of coping. He feels only anger, stoked by extremists who say violence is the only way to change their fate. Malaak's mother begs him to stay away from harm, but Malaak lives in fear of losing her brother as well. What will it take for her to find her voice--and the strength to move past the violence that surrounds her? Cathryn Clinton received her bachelor's degree in English from the University of Iowa and her master of fine arts degree from Vermont College. Her first novel, THE CALLING, was published in 2001. AboutA STONE IN MY HAND she says, "While in graduate school in 1998 I had a writing assignment: choose a picture of someone and write about that person. In an article about Gaza in National Geographic, I saw a picture of a young Palestinian girl holding a bird in her hand. There was a look of strength in her face. This intrigued me, and I wondered how this girl had survived both internally and externally when the conditions of her growing up years were so harsh. So I sat down and began writing the story of Malaak."